I have eventually got the swap blocks from the Spring 2010 swap off my design wall and into a top. I was not letting myself have anything to do with the 2011 swap until I had it pieced! Still need to quilt it though. My state guild has the theme of Diamonds for their show this year, hence the diamond setting. Attitude is everything - So pick a good one! You have all hidden your signatures so well that I am having trouble working out this one. I would like to put all your names on a label before I quilt it. I think it is from GA but not sure. Can someone help? Don't know who's block it is...but yay...you got one of my froggy ones! The setting is very nice. Hoppily quilting along with FROGGER - my Green Millennium, and TOAD - my Liberty. Quiltazoid equipped too! Thats really lovely Lyn, I love your setting. I really like the diamond setting too. Very pretty. 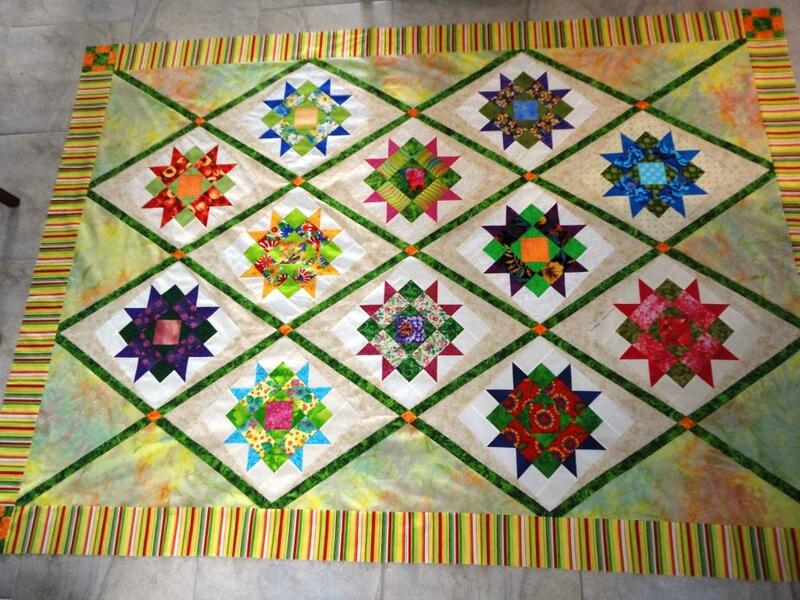 I love bright quilts and that one is stunning! It just jumps off the screen and into my heart! I love it!!!!! Love it! So bright and cheerful and the setting makes it so fun too! Dell 2016 Millie Frannie Ann Jr. with Bliss & she is Quiltaziod and Circle Lord Equipped with lots of Quilting Toys and now has Quilt Path! Thanks Jen. I have one of yours in this top too. Now I can do the label and then quilt it. Although I have been told their have been 7 quilt tops sent to my LQS from Townsville for the Flood Relfief that I asume I have to quilt first. Thanks everyone for your comments with regards to the setting. Trusty EQ7 and then double layer of freezer paper to make the templates for cutting. Very cool looking. That is a happy quilt. Lovely design and such nice bright fabrics, the setting fabric is perfect as is the striped borders. Are you planning on custom quilting. It will be beautiful. I hope you post pictures when it is finished. 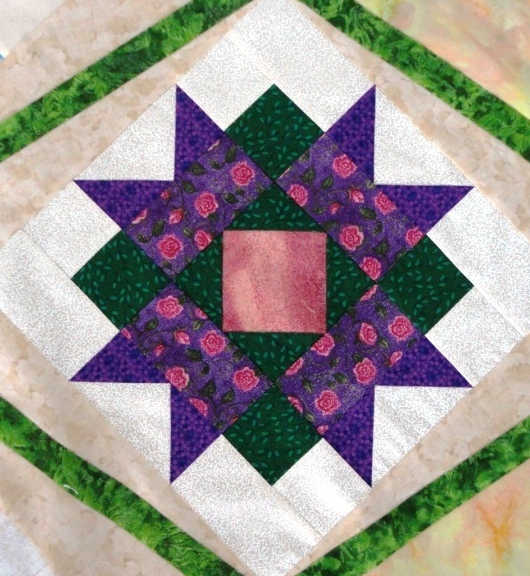 I love how you put this quilt together!! It seems like it would be the perfect way to take blocks that weren't exactly the same size and "even the playing field"! Wonderful!